You asked. We listened. Tappestry is gaining ground! We’ve created a Web bookmarklet for Tappestry. You can now track learning while on your desktop computer. Go to Tappestryapp.com to see how to get started with this easy new learning tool. Since we released the first Tappestry update last month, we’ve included a handful of major new features in this release while revising existing ones. We’re very excited to announce that you now have the ability to search inside of Tappestry for the first time. Additionally, we’ve highlighted location in this version, enhancing that feature set with all new ways to find learning around you. We strongly believe that where you are impacts how you learn, and being able to more easily track that will aid in your exploration of the community. Below is a complete list of new features and upgrades for Tappestry 1.2. SEARCH – You can search the Tappestry network for threads about subjects and ideas you are interested in. NEARBY THREADS – Find what others have learned in your immediate geographic area. ANNOUNCEMENTS – We’ve upgraded the Comments stream to show you how people are interacting with your threads. Now you can see when someone comments on and rates your threads in one spot! INTEGRATED WEB BROWSER – Links throughout Tappestry now open with the built-in Web browser. You don’t have to leave the app to learn more about the threads you have been reading. LEADERBOARDS – Easily find who is logging the most events and providing the most overall activity on the network. CATEGORY STREAM – Tap on a category to filter the public stream so you only see the threads you’re interested in. REDESIGNED STREAM VIEW – Larger type, more flexible design and an optimized experience to make browsing threads even easier. Coming this month: A native Android app, an iPad version, and a full Web version… Learning really is everywhere, and Tappestry is the only platform that allows you to share it! Do you have ideas for Tappestry? Maybe you have some questions? Contact us and let us know today. Ninety-four percent of farmers own a smartphone or a mobile phone, according to the latest research reports on mobile agriculture from Float senior analyst Gary Woodill and Float managing director Chad Udell. While the use of mobile technology for agriculture has existed for nearly a decade in other parts of the world, it has only recently begun to take ground in North America. Focus areas for these scans include mobile technology applications for industry professionals and consumers, and what the mobile technology could do for the industry’s future. Chad and Gary will present a two-day ASTD Mobile Learning Certificate workshop in Alexandria, Va., on Oct. 11-12. These recognized experts and authors will look at current mobile technologies, explore the steps to create and implement a successful mobile learning project for your organization, and even build a prototype as a class. We will present the workshop in Chicago in November, and San Jose in January, so if you can’t make the October dates, you have other opportunities coming up! We recently launched a brand-new app that allows developers utilizing the Tin Can API to create and view statements in a learning record store (LRS). Developers can debug, diagnose and explore the data being sent to and received from a Tin Can LRS. The Tin Can Statement Viewer is available for iOS free of charge. Additionally, we’ve also released the Tin Can iOS library. Make your mobile learning projects Tin Can-compliant with this library. We invite you to download the Tin Can iOS library for free. But hurry! This version expires Nov. 1. Contact us to learn how you can license it after that deadline expires. It’s only a matter of time before your company adopts mobile learning, if it hasn’t already. 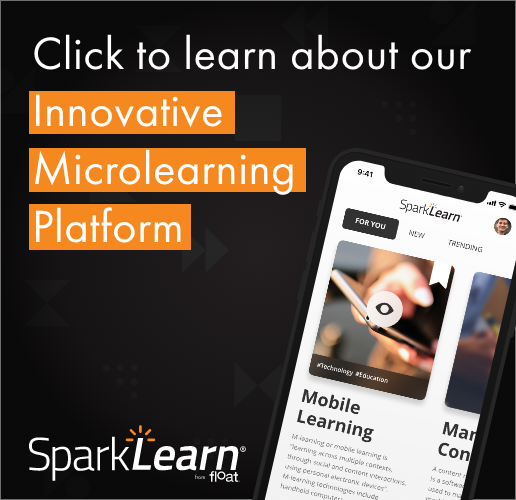 Scott McCormick, one of Float’s founding members, will deliver mLearning Straight Talk directly to you in a webcast for HR.com on Wednesday, Sept. 19. Despite having thrived half a century ago, media theorist Marshall McLuhan’s thoughts about the impact of new media on learning and culture still seem to ring true today for mobile technology. Gary recently reread several of McLuhan’s books and took a stab at what McLuhan might say about mobile in an extended blog article.